After something of an Anglo-centric start to our series of twelve posts (see Part II and Part III), it's time to appease those Francophile Floatingsheep Fanatics. Focusing our attention on two separate, but not interchangeable, terms -- Père Noël and Père Fouettard -- we can start drawing some fairly clear conclusions about the way the French celebrate Christmas. Le Père Noël est très formidable. Even more interesting is how well the use of Père Noël illuminates the linguistic contours of French speakers, primarily France but also extending into parts of Belgium, Luxembourg and Switzerland. For the most part, it is commonly accepted that the French simply use Père Noël as the local translation of Santa Claus (although technically it means Father Christmas). Indeed, the comparison shown in the map above shows Père Noël to be the dominant representation within the country, unlike the UK where there is fierce competition between Santa Claus and Father Christmas. With Père Noël established as the legitimate bearded giver of gifts in France, why include Père Fouettard in our search? Thanks to a helpful comment from a reader, we became aware that Père Fouettard is a locally-specific tradition in Lotharingen, France. 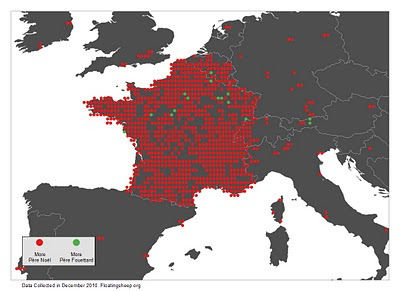 And true enough, the cluster of four green dots signifying the prevalence of Père Fouettard in the northeast of France is the general location of Lotharingen. But who is this le Père Fouettard anyways? Well, he's the one that accompanies St. Nicholas to punish (literally whip) all of those kids who don't deserve awesome presents. So, frankly, you don't want to get to know the guy. Kind of makes you feel sorry for all those folks in eastern France, doesn't it? But at least one can understand the preoccupation with keeping track of where "the whipping father" is. And don't worry, we're tracking some other variations of St. Nicholas' posse, such as Krampus and Zwarte Piet. Unfortunately we seem to have missed Belsnickel.